Fourth Row Center: Film Writings by Jason Bailey: In Theaters: "The Muppets"
Segel and Stoller’s screenplay finds that decrepit studio and theatre (from whence The Muppet Show was broadcast) mere days from destruction at the hands of a villainous Texas oilman (Chris Cooper). 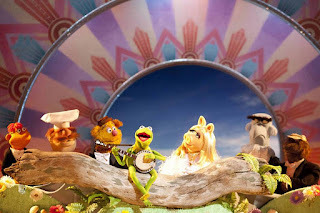 When Walter, an ostracized puppet who takes the Muppets as a source of inspiration, overhears the evil plan, he enlists Gary and Mary to help him alert Kermit (Steve Whitmire)—who, no surprise, decides to get the old gang together and put on a show to raise enough money to save the theater. This is exactly the kind of corny old showbiz chestnut that the early films spun out of—as before, the key is the the humor of the script, the wit of the songs, and the lovability of the characters. Segel and Stoller’s script is full of inside jokes, throwaway references to the length of the film and the size of the budget, Reno Muppets cover bands and Scooter heading off to the TED conference. The original songs (many of them provided by Flight of the Conchords co-star Bret McKenzie) are utterly charming and slyly funny (except for the Adams/Piggy disco number, which is a bit of a dud), while the familiar tunes are well-chosen; I’ll own up to getting a bit of the gooseflesh when they strike up the Muppet Show theme at the top of the big show. But what director James Bobin (also a Conchords alum) most ably captures, and capitalizes on, is how we feel about the Muppets. The filmmakers don’t just reunite the audience with the characters—they reunite the characters with each other. Their estrangement provides plenty of comic material, yes, but also some incredible pathos; there is an early number called “Pictures in My Head,” in which Kermit laments the loss of these friendships, and damned if your humble correspondent didn’t get just a little misty-eyed. Are these pathos earned, or carried into the theatre with us? As the film begins, it’s the latter—we love these characters so much, those of us who grew up with them, who memorized those movies, who watched those shows, who squeezed our Fozzie Bears close to us when we drifted off to dreamland. The Muppets understands that, respects that, and loves these characters too—for their sweetness, their gentle humor, their charm, and their sheer goodness. And that, dear reader, is why the tears streamed down my cheeks (and are threatening to do so again, as I type these very words) as I watched Kermit and Piggy take that stage late in the film and sing a song of pure heart, their most indelible number, “The Rainbow Connection.” In that moment, it’s not just nostalgia; it’s beyond Gen-X jukeboxing. 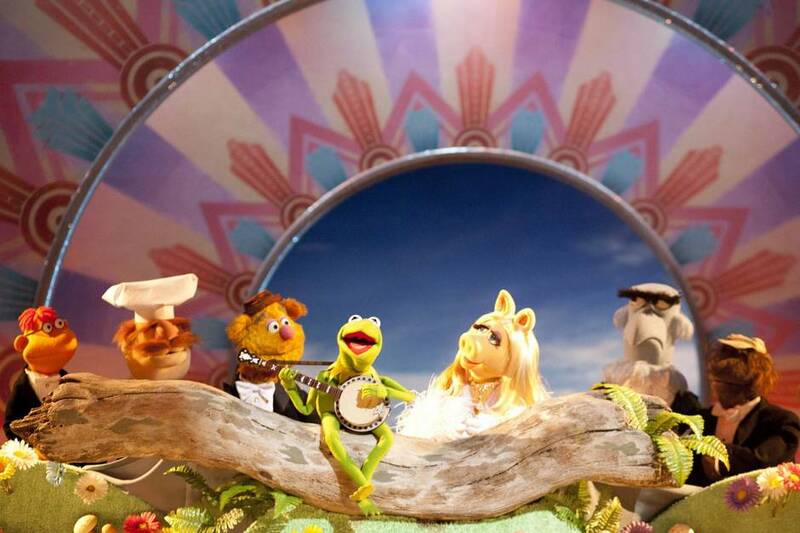 When it gives us that song, The Muppets is tapping into our shared love for what these characters were to us, and how they taught us that it was okay to love, laugh, and trust, to assume the best of ourselves and everyone else, and to do it unapologetically. “We know that it’s probably magic,” they sing, and y’know what? It is. "The Muppets" opens nationwide tomorrow.